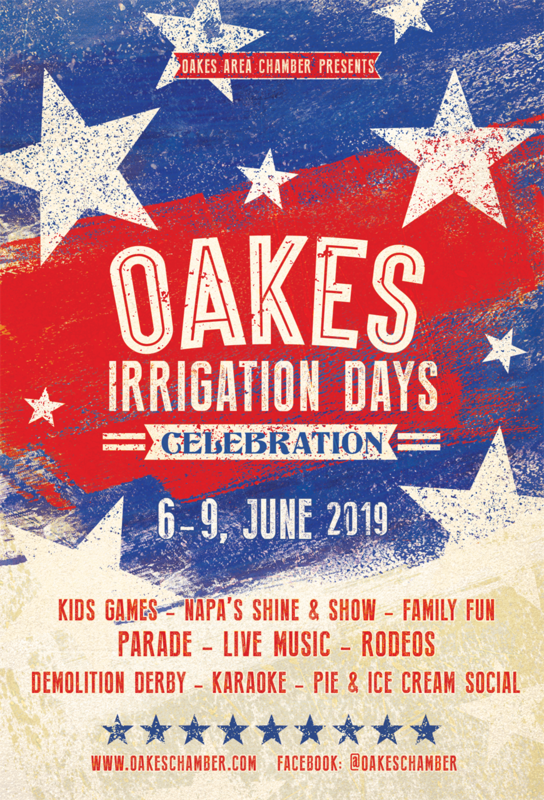 The community of Oakes invites you to join in the fun and excitement of our 48th Irrigation Days, June 6 - 9th! This annual city-wide celebration is the perfect kick-off to summer with a jam-packed weekend of activities. A great experience for families, couples, and groups, everyone will find something to enjoy with a full schedule of events including Grand Parade, Rodeos, Street Dances, Kids Games on Main, Community Karaoke Contest, Pedal Tractor Pull, Demolition Derby and more! In regard to this year’s theme, June 6, 2019 marks the 75th Anniversary of D-Day and the Normandy landings. This seaborne invasion began the liberation of France and laid the foundation for the Allied victory on the Western Front in WWII. To commemorate this significant event in history, the 48th Irrigation Days Celebration will be a “Salute to our Veterans” with a patriotic/American Theme. Thursday’s Karaoke Kickoff gets the celebrations started as contestants sing the summer night away performing for friends, family and community. The Grand Parade will take place Friday, June 7 at 5:30 pm (no preregistration for parade entries, line up will be on a first come first serve basis following Parade Marshalls and Public Service Departments). This year’s street dances will feature live music from The Woofers (Friday) and Slamabama (Saturday), sponsored by the Angry Beaver Lodge. Enjoy back-to-back nights of rodeo action with the Bear Creek Roughriders’ Ranch Rodeo with Calcutta on Friday and BCR Rodeo on Saturday. Look forward to other returning favorites including NAPA’s Shine & Show (Car & Motorcycle Show), Kids’ Games on Main, Sue McLean 5k Run/Walk, Community-wide Rummage Sale, and Demolition Derby! Irrigation Days is an annual, multi-day celebration taking place the second weekend of June. It is a time to celebrate, relax, and enjoy everything the community has to offer. Youth games and so much more. Growing, celebrating and building the future together.